As I was planning, designing, and musing over how to build our earthbag wall and cob pizza oven I was reading articles about how much wood a wood fired oven uses. This correlates with my own experiences in building two previous wood fired ovens in our local community gardens here is Tassie. An article in Owner Builder magazine about rocket mass heaters and stoves by James Henderson caught my eye. It was the very small amount of wood they use and the high amount of heat that they can output. More research was warranted. I found the following to be very useful. After more looking I decided to build a concrete and perlite rocket stove to test out the concept. There are lots of videos on how to make these very cost effective, simple stoves. For instance try here. I used perlite mixed into the cement to make a lighter concrete. It worked but was very crumbly. However after the trial I decided that I would incorporate a rocket stove as the main heating element of our Pizza oven. Continuing to research I decided to build the rocket stove from clay bricks. Fire bricks are ideal but here in Tasmania they are very expensive so I found a source of clay bricks from Austral Bricks at Longford. I built a trial rocket stove from loose bricks on the patio and added a length of stainless steel flue as the chimney. The idea is to have what is known as a J tube. The short upright end of the J is where the sticks are fed in and then the burn happens in the horizontal part and the exhaust and heat are pulled up the long vertical part of the J. The term Rocket Stove is because when they fire up they sound like the roar of a rocket. If you take away the chimney the fire goes out very quickly. Having trialed the stove and finding out that indeed it heated up to over the 350 degrees C that my infra red thermometer goes up to in quite a short time it was time to build the rocket stove into the earthbag wall. The bricks were mortared together using fire cement and then the chimney was added. The chimney has been made from a stainless steel flue riveted to a circle of cement sheet with a hole cut out of it the same diameter as the flue. Slots were cut around the flue and bent out wards. The idea is to to get as much heat up the chimney as possible so it need to be very well insulated. To do this I made an outer container from some scrap sheet metal and riveted it to the outside of the cement sheet. 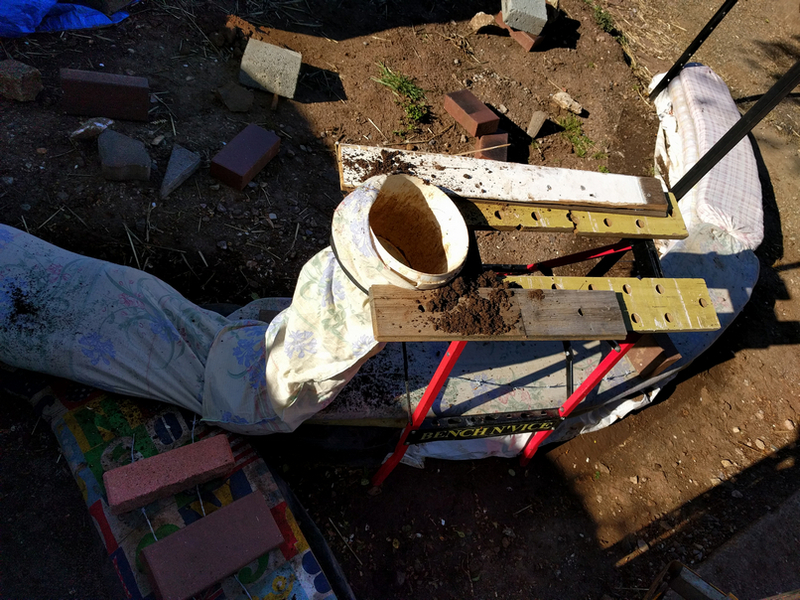 Then the perlite/cement stoves I made originally were crushed (they were very crumbly) and recycled with some more cement and a little water and poured into the cavity. The chimney was placed onto the rocket stove. Chicken wire has since been wrapped around the outside and will be coated with a cob mix to make it look good. The thinking at this point was to finish the earthbag construction and pour a suspended concrete slab around the chimney with the flue sticking out the top just under the height of the clay pavers that will be used as the base of the oven. A recycled barbecue plate with feet welded on it will be placed over the top of the flue and this will be the main cooking area for pizzas. 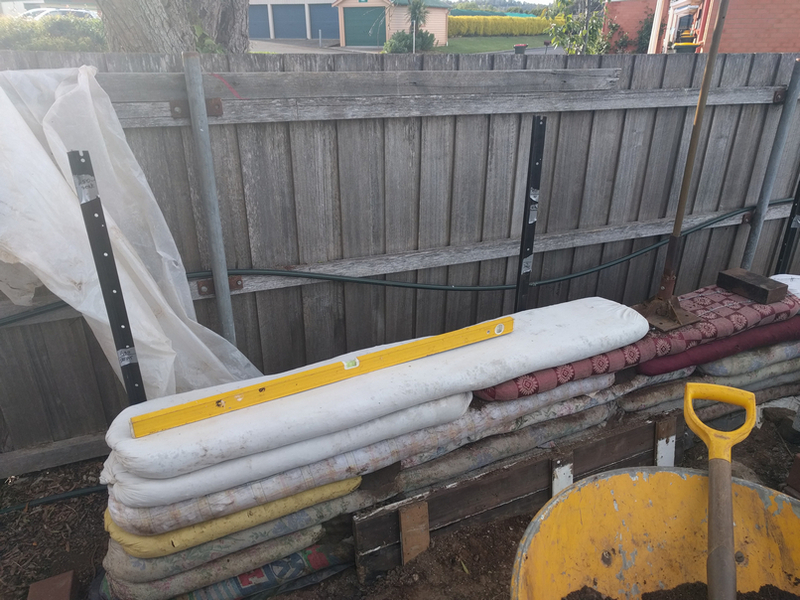 When I was completing the earthbag construction I made some fabric tubes half the width of the normal ones (350mm) these I placed around the edge of where I wanted the slab to be. This formed an earthbag platform on which I could place the steelwork. These earthbags I pinned to the wider ones using reo offcuts driven vertically through the bags. The slab was poured leaving a 100mm space between the top of the slab and the top of the earthbags. This was filled with glass bottles and sand making an insulated floor to the pizza oven. For about the last three years I have been thinking about building a cob pizza oven and a nice curvy earthbag wall to create an entertaining area at the end of our deck. There is a concrete slab there that a shed used to be on and I thought I would use that as the basis of our new entertaining area. I have built a wall from earthbags and a pizza oven from cob before in a local community garden. Now I would be able to combine the two. I get inspiration and information from the following. A curved wall is very strong so as our house has a yin and yang theme running through it I based the design on this. A curved wall that will have a seat at each end, a preparation bench on the Pizza Oven side and a sink on the veggie garden side. This curved wall runs through into the U shaped pizza oven area and the continues along side the fence to create another bench top area and athe seat at the end. See gallery at end of post for more visual detail. Normally earthbag walls are built using polypropylene bags or tubes but as this build is designed in my mind to be as low cost as possible we visited the local tip shops and bought a large number of queen or king size sheets and doona (duvet) covers for very little cost once we explained what they were for. The tip shops were glad to get rid of the really ugly or old sheets etc. These were cut into strips 700mm wide and overlocked into a tube. This gave a dimension to the earthbag wall of approx 300mm deep and 50mm high each layer. The next step was to dig foundations and lay in some plastic. This is to wrap up the first 3 or 4 layers of earthbag so that they become a stem wall and acts as a barrier to moisture wicking up the wall. When I last built an earthbag wall I used clay from the community garden. This time I was going to use a pile of dirt that I had collected over time as I did other projects around the garden. Our soil has quite a lot of clay in it but some of the dirt was dried topsoil. I mixed the two when I loaded the wheelbarrow. First of all I used the dirt I had dug out of the trench. Earthbags are filled with soil or clay or scoria, laid in position on top of two rows of barbed wire (except for the first layer, this was laid straight into the trench that I dug and lined with builders plastic). The earthbags are then tamped down flat and firm using a tamper. Cutting the base out of a small recycled plastic bucket it became the ideal sized funnel. I used a length of elastic tied into a loop as a means of temporarily holding the funnel inside the fabric tube. Step by step to filling recycled fabric earthbags. Either have a helper hold the funnel or create a holder so you can use a small bucket to fill the earthbag with soil. Make sure that the soil is a little damp. it should hold together when squeezed with your hand. Some websites and books say to add a small percentage of cement but I decided not to. When earth bag has some soil in it (you need to be able to lift it!) place earthbag in position. Continue filling until it is nearly full. You need enough earthbag left to be able to twist closed and tuck underneath the bag. The weight of the soil should keep it closed. tamper on right. Check for level. Note barbed wire on red coloured earthbag. Also star pickets to keep wall vertical. A few things that made life easier. Star pickets are your friend. I drove six star picket in at intervals ensuring that they were vertical. They were driven in to the correct finished height of the wall, in this case 1200mm. I made sure that the earthbags touched the star pickets and this kept the wall vertical. it is easy for it to end up out of shape if you are not careful. The tamper was made from scrap steel from the tip welded together and a broom stick used for a handle bolted in. The handle broke on occasions and I just replaced it. As the wall became higher it was easy to cut the handle down to make it shorter and easier to use on the higher walls. Holding down the barbed wire with bricks. I found that I could use a brick to weigh the end down and then position the wire in one run so that I ended up with two parallel strands. Using bricks at intervals ensured that the wire stayed where I wanted it. As I laid the earthbags I would remove the bricks. Lay the earthbags in a “stretcher bond” pattern.That is make sure that all joins are always overlapped. You can see this clearly in the last photo above. If you need to cut a bag short do so. tamper on right. Check for level. A chance to talk to the owners of two very different sustainable homes, ask them the burning questions you might have about aspects of sustainability in a home and enjoy some great morning or afternoon tea. Sustainable House Tours – The inside story. 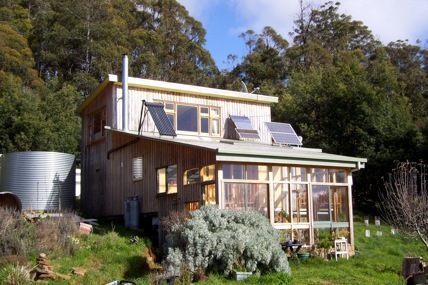 From the folks that brought Sustainable House Day to Northern Tasmania. Come along and pick the brains of sustainable home owners about the nitty gritty of their experiences creating and living in a sustainable home. Cost: By donation. You pay what you think the session was worth. Session Length: 90 minute session at each home. Each home open in the morning and afternoon. You pick the session that suits you. Bookings: Essential. Contact Lisa on 0427 283 403 or email annelisa(at)westnet.com.au Details of locations provided when booking. 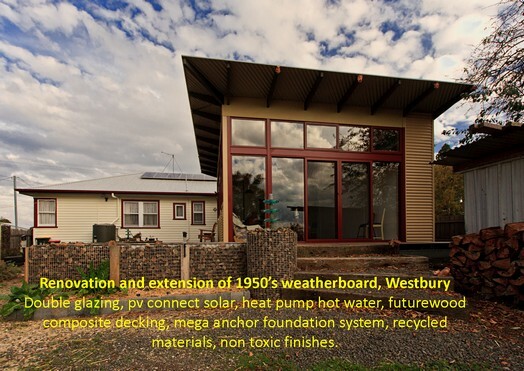 House 1: Transformation of a 1940,s weatherboard house that optimises energy efficiency and minimises running costs. Sharing (by blog) extensive research on all materials used for sustainability and availability. House 2: Maximum sustainability with minimum environmental footprint. Purpose designed passive solar house.